DARIEN — The Head of the Charles Regatta in Cambridge, Mass., is always a bustling event. Thousands of rowers and spectators crowded the area along the Charles River on a sunny day in late October. Widely regarded as one of the most prestigious races, the three-mile course is the world’s largest two-day rowing event. Yet Quin Daly, 13, wasn’t nervous as he prepared to row. Daly and his partner, George Lathrop, of Greenwich, were aiming to become the youngest rowers to compete in the men’s youth doubles division. The two middle school students met at the Maritime Rowing Club in Norwalk. It was Lathrop’s dream to be one of the youngest rowers to compete at the Head of the Charles. The two got a slot to row through a lottery and had to get an exception to row in the high school division. They underwent months of training under a senior coach, including practicing the Charles River course the weekend before in a smaller regatta, to get a feel for the turns and bridges of the river. 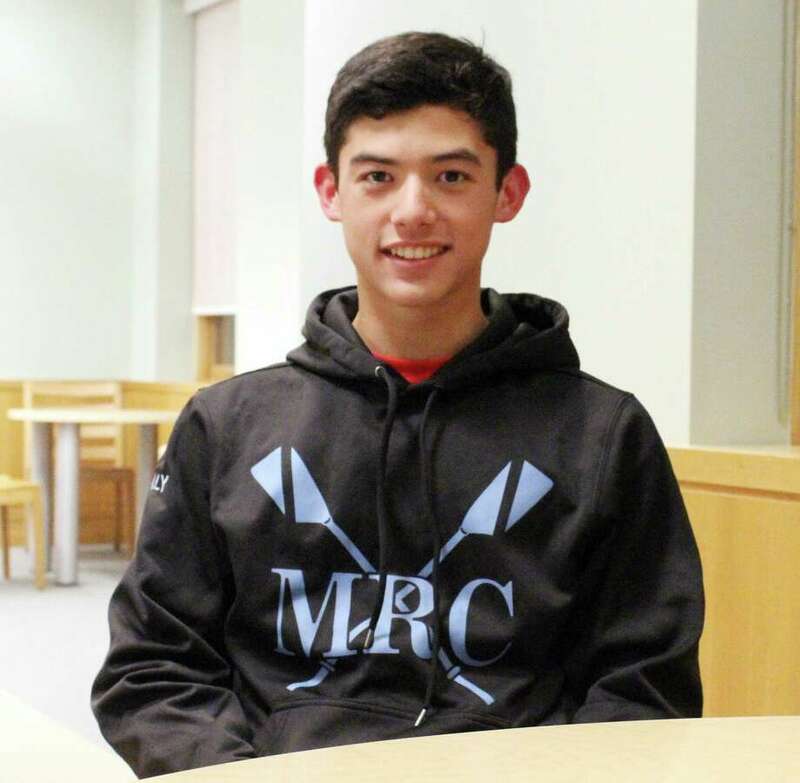 Daly, an eighth-grader at Middlesex Middle School, discovered rowing at the beginning of sixth grade, while skiing competitively. Rowing replaced skiing as Daly’s primary sport. He rows on the high school team at Norwalk’s Maritime Rowing Club, practicing five to six days a week for two to three hours a day. Practice is year-round on the Norwalk River, though in the winter months Daly and his team use an indoor rowing tank. He also trains on land through running and lifting weights. Most of Daly’s spare time is spent at practice, leaving little room for other sports and acitvities (though Daly still skis semi-competitively on the weekends). Daly’s mother, Susan, said she likes the attention the sport demands of her son, especially when it comes to working up to new levels and divisions. Daly and his partner came in 41 out of 48 in the regatta, a good time for middle schoolers competing at the high school level. Daly directed the boat, navigating it between the other competitors and turns of the river. While Daly said it’s possible to see boats tip on such a course, getting a chance to run it beforehand made him confident. In addition to accomplishing a personal goal by competing, Daly and his partner raised $21,785 for Children of Fallen Patriots. The two hope to raise $30,000 for the cause, which they chose for Daly’s grandfather, who served in the Pacific Theater in World War II. Going forward, Daly hopes to keep rowing competitively into high school and college. He said he’s drawn to the adrenaline rush of the sport that comes from going “100 to 0” as he tries to go as fast as possible to make his best time.